Wood  provides good summaries of the various periods and categories and these will be used when they are explored in detail. Before stamps, there was the Min Chu, private Chinese postal agencies. 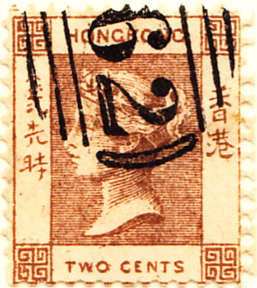 Foreign traders set up their own system to save costs, starting in Shanghai in 1865 and expanding from there along the coast, including nearby Japan (thought no specific stamps seem to have been issued for use there, only distinctive cancellations). The turn of the century saw numerous foreign post offices. As noted, Offices Abroad are dealt with in a separate display, but details of Foreign Offices in China will be recycled here. In addition, Germany occupied the port of Tsingtao in 1897 and later leased the surrounding area of Kiaochow until surrendered to the Japanese in 1914. France leased Kwangchow in 1898: it was governed from Indo-China. China itself had offices in Korea and Tibet. Indian forces operated field post offices as part of the China Expeditionary Force to oppose the Boxer Rising in 1900. 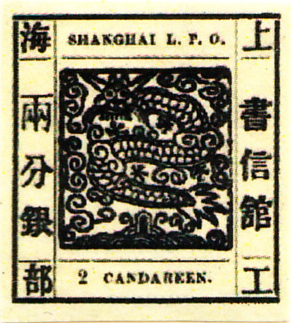 In 1887 stamps were issued by the Imperial Customs Post and in 1897, the Chinese Imperial Post was introduced which, by decree, put the treaty ports' municipal posts out of business. These are the stamps of the initial entry in Display 10. The Boxer Rebellion in 1900 reflected growing dissent and the Empire increasingly destabilised , leading to a revolution led by Sun Yat-sen and the establishment of the Chinese Republic in 1912. Wood  states "The first half of the 20th century was largely one of war against an increasingly aggressive Japan. Korea and Formosa were given up and Manchuria was seized by Japan." Internal unrest was caused by growing communist factions that eventually took power after WW2 but in the meantime give rise to fragmented and localised postal services. Japan occupied parts of China during WW2. Before that, in 1905, following the Russo-Japanese war, Japan gained a foothold on the Chinese mainland and in the 1930s established what Wikipedia describes as the'puppet kingdom' of Manchukuo which created 'many interesting cultural chimeras, including stamps'. It reverted to China after WW2. 'The Nationalist forces ... were driven from the mainland in 1949 to seek refuge on Formosa (Taiwan) as the Republic of China. In the same year, the Communists under Mao Tse-tung proclaimed the People's Republic of China with the capital at Peking (Beijing). Gibbon thus follows on the pre-war Chinese catalogue numbers into the 1949 mainland communist People's Republic of China (PRC), while Scott continues that listing into the island of Taiwan (aka Formosa), previously a Chinese province. Scott restarts PRC at #1.